April in Libraries means CityRead, a London-wide book club, and this year’s book is the aptly named ‘Rivers of London.’ Part police procedural, part high fantasy complete with wizards, ghosts and vampires, Rivers of London is above all grounded in its setting – the grand, gritty, sprawling mass of London. 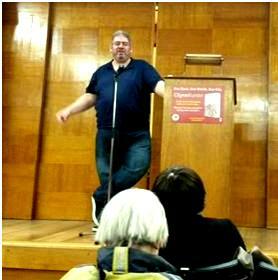 On Monday, author Ben Aaronovitch visited Kensington Central library as part of his tour of ALL the London boroughs (do check out his highly entertaining blog, wherein he charts this heroic journey). The event was a roaring success and it was followed later in the evening by the Central Library Reading group, who met to discuss the book. It’s still not too late to pick up a copy at your local library – we even have some free copies to give away – and join the biggest book club in London. If you missed your local reading group, you can always share your thoughts about the book with us in the comments below. I canvassed my colleagues – many of whom read and loved Rivers of London – for their quick reviews and thoughts. Harry Potter grows up and joins The Bill. 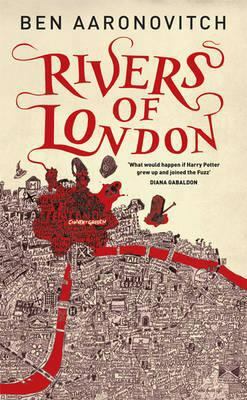 Subterranean excitement, with murder and supernatural goings on along London’s lost rivers… whilst Rivers of London isn’t something I’d have chosen for myself I was very glad I read it and can also see exactly why it works so well as a CityRead title. A gripping series of books with great touches of London which you must get round to reading. Surely the TV series cannot be far away where Peter Grant and co would be brought to life! Also, look out for the graphic novel, which Ben is drip-feeding via his blog and Twitter. It’s the best fiction book I have read in a long time. Ben’s love of the West End, where a lot of the book is set, and of London generally underpins the book and sets the scene, but the main joy of the story is the fascinating characters he has created and who develop as the books progress through a series of supernatural mysteries. When I first heard of the books I was doubtful I would enjoy them (I never liked Harry Potter for instance) but once you try them you are hooked! What I loved the most about Rivers of London was how, as a Londoner, I recognised so many of the places the story takes us – from Covent Garden to Wapping; the old school glamour of J. Sheekey Oyster Bar to the Bow Magistrates Court – but all with added little nuggets of history I never knew or suspected. This is a great book for Londoners; it made me love and appreciate my home city a little bit more. A misleading title! I thought it was going to be a about the rivers of London! Was disappointed that neither the Rivers Quaggy nor Ravensbourne were mentioned – very good read, though! Click here for more information about what’s on this month at your local library. The Cityread London website has more information about what’s going on around London, and how you can get involved. Previous A Visit to Gosh!